Shakespeare in the Arb began in the spring of 2001. Then Matthaei-Nichols director of development Inger Schultz applied for a three-year Ford Motor Company Grant for the Arts. Having received the grant, Schultz invited director Kate Mendeloff from the Residential College to use the first part of the award to produce a play in Nichols Arboretum. Schultz had been impressed by Mendeloff’s outdoor production of Chekhov’s The Seagull. Mendeloff, who specializes in early modern and modern drama, originally considered directing Chekhov’s work once again. Instead she chose Shakespeare’s masterpiece A Midsummer Night’s Dream, a play she says is “perfect for the Arb,” with its natural setting, structure, and language. 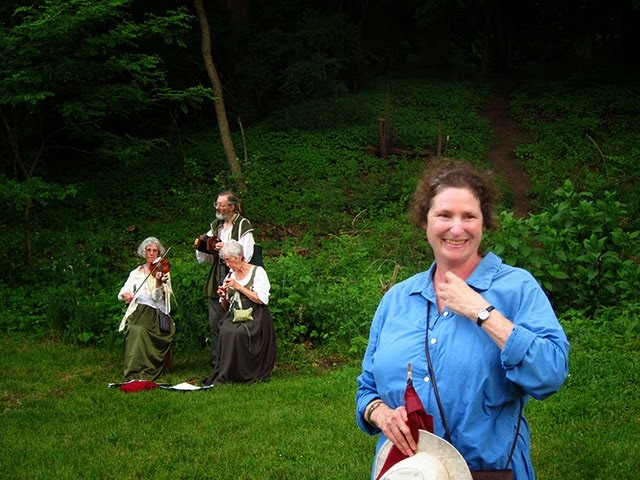 Midsummer, a crowd favorite, has enjoyed a repeat performance every five years and will be performed again this summer for the fifteenth anniversary. Opening weekend performances in 2001 struggled at first, battling low temperatures and cold rain, and as a result small crowds. But under the clear skies of the second weekend, roughly two hundred visitors appeared for each performance. In 2002 the show featured a double cast, charged for tickets, and sold out every performance for three weeks. The Ann Arbor tradition of Shakespeare in the Arb bloomed in full. 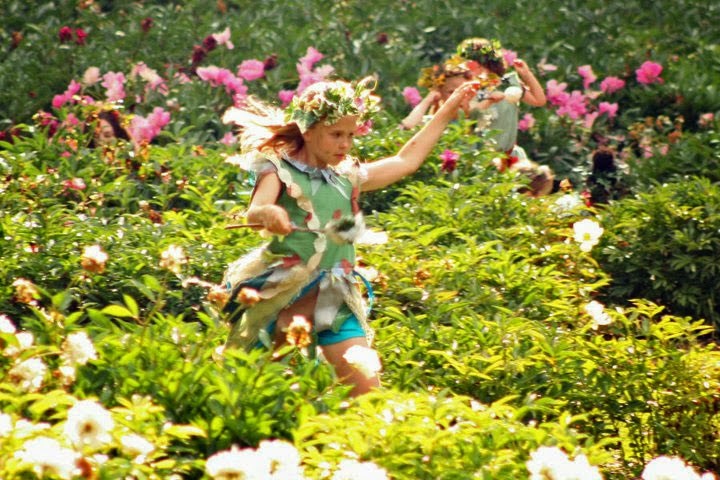 Fairies in the 2010 production of Midsummer run through the Nichols Arboretum Peony Garden. The Arb is a unique stage, and as long-time actor Joe McDonald says, “It’s an essential part of the cast.” Mendeloff loves the way productions and rehearsals in the Arb unravel organically, and the way the setting provides inspiration, countless unusual challenges, and moments that are “magical and serendipitous.” Each performance of Shakespeare in the Arb is unique and filled with the unexpected. Butterflies and deer often drift through the backdrop. Other sights are slightly less majestic. Joggers, curious dogs, hospital helicopters, joy-riding pilots, trains, and hail storms have all graced the stage with their presence. But as actor Carol Gray put it, “Arb audiences are extremely hearty and brave,” and the cast humorously compensates for interruptions as if they had actually happened in the world of the play. “What dark magic is this?” one actor yelled as a train roared through a scene in The Tempest, a play that features “dark magic.” Another obstacle is the unusual acoustics of the natural setting. Mendeloff tries to choose locations for scenes that are natural amphitheaters, like Heathdale, or that have trees in the background to project sound towards the audience. The organic nature of the Arb and the development of each show is a source of inspiration for Mendeloff and her crew. In the winter of 2003, Mendeloff was walking through Dow Prairie when she slipped on the ice. As she sat and collected herself in the snow, she envisioned a horse galloping towards her down the path. Sure enough, that summer’s production featured a horse jogging through the prairie and into the scene. Actor Carol Gray says, “Kate is a fearless experimenter and a gracious leader, and the diversity of Arb alumni is a testament to her collaborative directing style.” Shakespeare in the Arb serves as an important link between the mission of Matthaei-Nichols, the academic side of the university, and the Ann Arbor community. In particular, these performances provide a remarkable experience for the students involved, who range from theater majors to future engineers. With double and triple casts each year, actors are forced to work interchangeably with other actors whom they may have never rehearsed with. And of course, actors have to project their voices and be physically fit in ways that a traditional theater environment wouldn’t require. Mendeloff also hires a crew of assistant student directors. “It’s a very non-hierarchical structure of rehearsal,” she says, “It has to be. We have to take advantage of every day it’s not raining.” As a result, the actors split into groups all across the Arb, working simultaneously on a variety of scenes under the leadership of student directors, while Mendeloff oversees the greater creative project. These performances also influence the Arb’s development in more concrete ways. Former Matthaei-Nichols' employee April Pickrel recalls how Shakespeare in the Arb forced staff to introduce now vital resources to the Arb, such as a golf cart, a cash register, and restrooms. What are the 2015 dates for this event? Thanks! Just returned from the June 4th premier of "A Midsummer Night's Dream." I've seen this play several times in a theater environment (WSU's Hilberry)& can say I've never been more engaged or entertained than by today's performance. Great symbiosis of the natural amphitheater settings of the Arb, an energetic cast and great interpretation by a savvy director made for a fun evening. Kudos to all involved!